Newsreel segments, 1938-1946, featuring U.S. 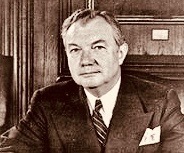 Solicitor General, Attorney General, Supreme Court Justice and Nuremberg prosecutor Robert H. Jackson (1892-1954): 1. Rep. Martin Dies (D.-TX) calls for exposure and prosecution of “fifth column” agents in the U.S.; 2. AG Jackson responds, lauding Army & Navy Intelligence and the Federal Bureau of Investigation (Nov. 30, 1940); 3. AG Jackson at DOJ, with FBI Director J. Edgar Hoover, handing diplomas to National Police Academy graduates (Mar. 30, 1940); 4. AG Jackson standing to President Roosevelt’s right on the dock in Port Everglades, Florida (Mar. 27, 1941); 5. SG Jackson, Admiral William Leahy & General Malin Craig outside the White House helium conference (May 11, 1938); 6. Supreme Court appointee & former AG Frank Murphy speaking at DOJ (1940); 7. Justice Murphy & AG Jackson taking their oaths of office at the White House (Jan. 20, 1940); 8. Chief Justice Harlan Fiske Stone (1941); 9. Justice James F. Byrnes and Vice President Henry A. Wallace (1941); 10. AG Jackson at his desk (1941); 11. Justice Jackson swears in Secretary of State Edward Stettinius (Dec. 1, 1944); 12. Justice Jackson swears in Sergio Osmena as President of the Philippines following the death of President Manuel Quezon (1944); 13. Signing of the London Agreement creating the International Military Tribunal (Aug. 8, 1945); 14. Justice Jackson outside the Palace of Justice, Nuremberg, occupied former Germany (1945); and 15. Justice Jackson arriving at Tulln airport, outside Vienna, Austria, during the Nuremberg trial (Apr. 13, 1946). A centennial celebration of Albany Law School 1912 graduate Robert H. Jackson has sparked local interest surrounding his time spent in the Capital Region. Robert Houghwout Jackson (February 13, 1892 – October 9, 1954) was an American attorney and judge who served as an Associate Justice of the United States Supreme Court. He had previously served as United States Solicitor General, and United States Attorney General, and is the only person to have held all three of those offices. 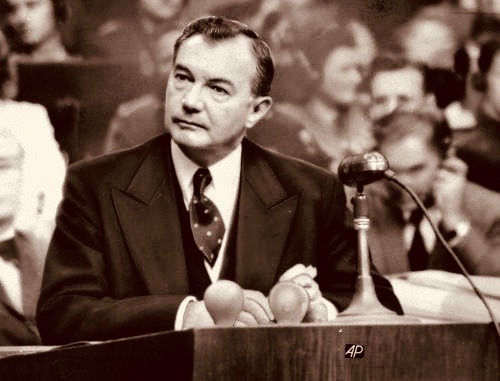 Jackson was also notable for his work as the Chief United States Prosecutor at the Nuremberg Trials of Nazi war criminals following World War II.